I am not really sure of my feelings for this book. – On the good side there was plenty of action and the concept at the ending of the book seems to be quite interesting. (view spoiler) I was sure that at some point we needed to know what was outside the fence, and I can’t wait to see what happens next with our characters. – On the bad side, parts of the action didn’t make much sense. So much hiding in plain view, so much running away with no place to go, so many suicidal missions, so many broken promises, so many lies, so much mystery without a solid base… I guess you see where I’m headed… I thought it was a bit overdone. But let’s take it step by step. First the COVER – it is beautiful. 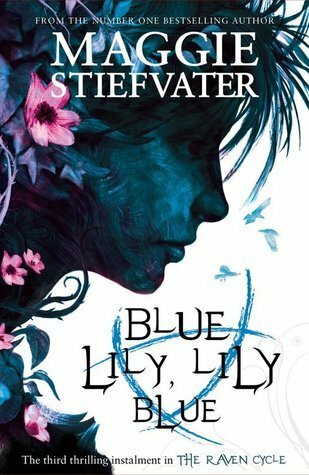 I don’t care that it doesn’t have much to do with the story, as it has been design in the middle of the writing process, all I care is how lovely it is (as well as the cover for Divergent). I love it! Writers, when creating a world, have a great power over it and some of them are not afraid to use it. They are not afraid to put the characters through hell and back, they are not afraid to hurt them, and they are not afraid to kill. They also have the power to make us care, which is the most powerful thing, because words can create and they can destroy as easily, and it’s a great skill to do them both and still be loved by your readers. Veronica Roth managed to do that pretty well. I loved the fact that we had a smooth transition between these 2 books, without a period of time when you need to fill in the blanks. It starts from the very moment Divergent ended, as we waited to see what was supposed to happen with the characters when they reached their destination. On the bad side, parts of the action didn’t make much sense. Tris was going through a rough time and she was getting into suicidal situations more than not. Also there were so many lies and secrets that I got tired to keep up with them. The suspense was there to keep you going, but after a few suicidal missions I couldn’t care less about their shaken self esteem (and the fact that I knew I had still half of the book ahead made me worry even less). Veronica’s characters are full of life and driven by passion and a strong sentiment of justice and truth. They are high on their highest and low on their lowest and they manage to bring all the emotions they feel to you. It feels like an amusement park, because as much as it scares you, you still want another ride. The only problem is that too much dizziness can be a bit too much, and characters switching sides and lying all the time can get on your my nerves at times. Tobias – was quite left out of this story. He only got to make some convenient appearances here and there, and his actions were so contradictory that I don’t know what to think of him anymore. He seemed to have some secrets but were they revealed? I don’t think so. There was nothing special about the things he didn’t say to Tris, unless there is more to figure out in the next book. I liked them so much in the first book and in this one they made no sense as a couple, acting so strange, fighting only to make up again. It was crazy. I get that they had other things on their mind and the romance was not so important into the story, but their actions showed so little respect for each other and so many gaps in their relationship that it was really sad to ‘watch’. There were so many characters that appeared and disappeared that I didn’t get to care much for them. Yes, we knew some most of them from the first book, but it was not like in the first book we got along on the caring side either. There were also many surprises regarding the loyalty of some of them; I should probably read these 2 books again and see if their personality/actions match all these changes or if they were random to simply make the story work. (view spoiler) BTW, Peter (hope I got his name right) was such a strange character. His theory about taking sides is quite messed up and damn convenient… really! If I liked the romance in the first book, I pretty much got sick of it in this book. How many times can they lie to each other, hide things and betray one another, without kissing and making up afterwards in a matter of minutes? Yes, they had their moments (some of them were really cute, others a bit funny), but after a while I started to wonder why did they care for each other, why didn’t that love disappear between thousand of lies and mistrust? .. Are you sure, Four? All in one, this was an entertaining read, and the possibilities from here are endless. I can’t wait to see what new adventures await our beloved characters and how things will end in the next and last book in this series. 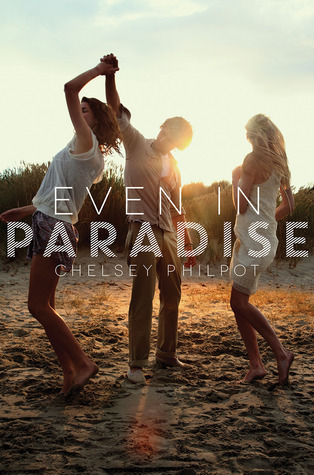 Hopefully you will love this better, so if you liked the first one you should definitely give this one a try too. Wow, just how COOL is the teaser trailer! I’m amazed and completely sold!! I want this now!!! After you view the first animation, select other characters from the bottom menu. OMG what an awesome Review!!! I really am a little scared about this book. I loved the first one and I do not want to end up NOT loving this one… too bad you didn’t love it as much! I can’t wait to see what you think of it too! I really didn’t like how reckless she became but by the end I understood that it was important for her to go through that and figure out who she was. I think we’ll get out good old Tris back in book 3! Awesome review, love! I understand that Tris needed to get through all this and I hope to see more of her brave side in the next book, it’s just that it got a bit repetitive with her being reckless just to be saved again. Also you got me thinking – maybe it would have been better to read the book in one sitting – there’s a lot happening and it’s a bit hard to keep up with all that if you get interrupted. 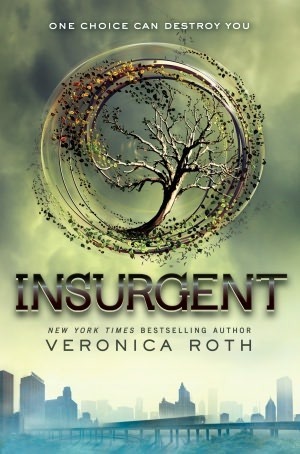 I’ve been hearing a LOT of good stuff about INSURGENT. Thanks for the honest review. I don’t know what to think of Tris after reading this. Sounds like someone needs to teach her a few Candor-like lessons! *sigh* It’s also really sad to hear that the relationship between Tobias and Tris has deteriorated. Half the book they are quite great as a couple, and I guess that they will be in the next one too, but you will be the judge of the rest of the story from this point of view. 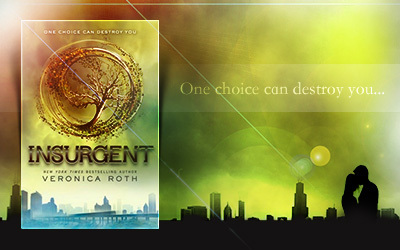 I hope you will like Insurgent. For me it was not as good as the first one, but many people liked this one better, so I guess it depends on the person reading it. Well, what can I say. I always love your reviews and this time I think the same. I agree with you! I felt a little… confused? about this book. Sometimes I really hated Tris and Four. I think the next book will be better anyway! I was so sure I was going to love this story to pieces; I was a bit lost when I realized that it was not really the case. Still enjoyable but I hoped for more – and you are right, I have the same feeling that the next one will be better. Happy reading to you too! First, I love all the graphics you do for your reviews, they are amazing. I felt about the same way you did. This book was a bit disappointing for me, too. I didn’t like the big changes I saw in Tris. Yeah I get she is suffering from PTSD but I didn’t like the selfishness and the lying either. I also was bugged by Four becoming Tobias…..Still the ending was a big shocker and I am anxious to see how this series will finish! But I did mind the changes the characters got through, as most of them seemed forced and made me think that I didn’t know at all these characters (and I like to feel like I know them, like their actions are the most natural in the world even when they surprise the hell out of me). Tris and Four had their ‘ups’ but too many ‘downs’ and I didn’t enjoy that… But I hope to like them again in the next book.